This article is about the metropolitan area of Brisbane, Queensland, Australia. For other uses, see Brisbane (disambiguation). Brisbane (/ˈbrɪzbən/ ( listen)) is the capital of and the most populated city in the Australian state of Queensland, and the third most populous city in Australia. Brisbane's metropolitan area has a population of 2 million, and the South East Queensland region, centred on Brisbane, encompasses a population of more than 3 million. The Brisbane central business district stands on the historic European settlement and is situated inside a peninsula of the Brisbane River, about 15 kilometres (9 miles) from its mouth at Moreton Bay. The metropolitan area extends in all directions along the floodplain of the Brisbane River Valley between Moreton Bay and the Great Dividing Range, sprawling across several of Australia's most populous local government areas (LGAs)—most centrally the City of Brisbane, which is by far the most populous LGA in the nation. The demonym of Brisbane is "Brisbanite" or "Brisbanian". One of the oldest cities in Australia, Brisbane was founded upon the ancient homelands of the indigenous Turrbal and Jagera peoples. Named after the Brisbane River on which it is located—which in turn takes its name from the Scotsman Sir Thomas Brisbane, the Governor of New South Wales from 1821 to 1825—the area was chosen as a place for secondary offenders from the Sydney Colony. A penal settlement was founded in 1824 at Redcliffe, 28 kilometres (17 mi) north of the central business district, but was soon abandoned and moved to North Quay in 1825, opening to free settlement in 1842. The development was partly set back by the Great Fire of Brisbane of 1864, and the Great Brisbane Flood of 1893. Brisbane was chosen as the capital when Queensland was proclaimed a separate colony from New South Wales in 1859. During World War II, Brisbane played a central role in the Allied campaign and served as the South West Pacific headquarters for United States Army General Douglas MacArthur. Today, Brisbane is well known for its distinct Queenslander architecture which forms much of the city's built heritage. It also received attention for its damaging flood events, most notably in 1974 and 2011. Major landmarks and precincts include; the South Bank Parklands and the Queensland Cultural Centre, City Hall and King George Square, the Story Bridge, the City Botanic Gardens and Parliament of Queensland, ANZAC Square, Howard Smith Wharves, Fortitude Valley, West End, Roma Street Parkland, New Farm Park and the Brisbane Powerhouse, St John's Cathedral, Mount Coot-tha, Redcliffe and Moreton and Stradbroke Islands. The city is a popular tourist destination, serving as a gateway to the state of Queensland, particularly to the Gold Coast and Sunshine Coast, popular resort areas immediately south and north of Brisbane respectively. Several large cultural, international and sporting events have been held at Brisbane, including the 1982 Commonwealth Games, World Expo '88, the final Goodwill Games in 2001, and the 2014 G-20 summit. In 2016, the Globalization and World Cities Research Network ranked Brisbane as a Beta world city. Indigenous Australians are believed to have lived in coastal South East Queensland for 22,000 years, with an estimated population between 6,000 and 10,000 individuals before white settlement. At this time, the Brisbane area was inhabited by the Jagera people, including the Turrbal group, who knew the area that is now the central business district as Mian-jin, meaning "place shaped as a spike". Archaeological evidence suggests frequent habitation around the Brisbane River, and notably at the site now known as Musgrave Park. The Moreton Bay area was initially explored on behalf of European colonisers by Matthew Flinders. On 17 July 1799, Flinders landed at what is now known as Woody Point, which he named "Red Cliff Point" after the red-coloured cliffs visible from the bay. In 1823 Governor of New South Wales Sir Thomas Brisbane instructed that a new northern penal settlement be developed, and an exploration party led by John Oxley further explored Moreton Bay. Oxley claimed, named, and explored the Brisbane River as far as Goodna, 20 km (12 mi) upstream from the Brisbane central business district. Oxley recommended Red Cliff Point for the new colony, reporting that ships could land at any tide and easily get close to the shore. The party settled in Redcliffe on 13 September 1824, under the command of Lieutenant Henry Miller with 14 soldiers (some with wives and children) and 29 convicts. However, this settlement was abandoned after a year and the colony was moved to a site on the Brisbane River now known as North Quay, 28 km (17 mi) south, which offered a more reliable water supply. The newly selected Brisbane region, at the time, was plagued by mosquitos. After visiting the Redcliffe settlement, Sir Thomas Brisbane then travelled 45 km (28 mi) up the Brisbane River in December 1824. Governor Brisbane stayed overnight in a tent and often landed ashore, bestowing upon Brisbane City the distinction of being the only Australian capital city set foot upon by its namesake. Chief Justice Forbes gave the new settlement the name of Edenglassie before it was named Brisbane. Non-convict European settlement of the Brisbane region commenced in 1838. German missionaries settled at Zions Hill, Nundah as early as 1837, five years before Brisbane was officially declared a free settlement. The band consisted of ministers Christopher Eipper (1813–1894) and Carl Wilhelm Schmidt and lay missionaries Haussmann, Johann Gottried Wagner, Niquet, Hartenstein, Zillman, Franz, Rode, Doege and Schneider. They were allocated 260 hectares and set about establishing the mission, which became known as the German Station. Later in the 1860s many German immigrants from the Uckermark region in Prussia as well as other German regions settled in the Bethania- Beenleigh and Darling Downs areas. These immigrants were selected and assisted through immigration programs established by John Dunmore Lang and Johann Christian Heussler and were offered free passage, good wages, and selections of land. The penal settlement under the control of Captain Patrick Logan flourished with the numbers of convicts increasing dramatically from around 200 to over 1000 men. He created a substantial settlement of brick and stone buildings, complete with school and hospital. He formed additional outstations and made several important journeys of exploration. Logan is infamous for his extreme use of the cat o' nine tails on convicts. The maximum allowed limit of lashes was 50; however, Logan regularly applied sentences of 150 lashes. Free settlers entered the area over the following five years, and by the end of 1840, Robert Dixon began work on the first plan of Brisbane Town, in anticipation of future development. Queensland was separated from New South Wales by letters patent dated 6 June 1859, proclaimed by Sir George Ferguson Bowen on 10 December 1859, whereupon he became Queensland's first governor, with Brisbane chosen as its capital. Over 20 small municipalities and shires were amalgamated in 1925 to form the City of Brisbane, governed by the Brisbane City Council. A significant year for Brisbane was 1930, with the completion of Brisbane City Hall, then the city's tallest building and the Shrine of Remembrance, in ANZAC Square, which has become Brisbane's main war memorial. These historic buildings, along with the Story Bridge which opened in 1940, are key landmarks that help define the architectural character of the city. During World War II, Brisbane became central to the Allied campaign when the AMP Building (now called MacArthur Central) was used as the South West Pacific headquarters for General Douglas MacArthur, chief of the Allied Pacific forces, until his headquarters were moved to Hollandia in August 1944. MacArthur had previously rejected use of the University of Queensland complex as his headquarters, as the distinctive bends in the river at St Lucia could have aided enemy bombers. Also used as a headquarters by the American troops during World War II was the T & G Building. About one million US troops passed through Australia during the war, as the primary co-ordination point for the South West Pacific. In 1942, Brisbane was the site of a violent clash between visiting US military personnel and Australian servicemen and civilians, which resulted in one death and hundreds of injuries. This incident became known colloquially as the Battle of Brisbane. The 1974 Brisbane flood was a major disaster which temporarily crippled the city. During this era, Brisbane grew and modernized, rapidly becoming a destination of interstate migration. Some of Brisbane's popular landmarks were lost, including the Bellevue Hotel in 1979 and Cloudland in 1982, demolished in controversial circumstances by the Deen Brothers demolition crew. 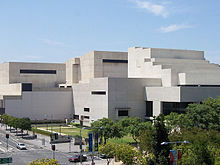 Major public works included the Riverside Expressway, the Gateway Bridge, and later, the redevelopment of South Bank, starting with the Queensland Art Gallery. Brisbane hosted the 1982 Commonwealth Games and the 1988 World Exposition (known locally as World Expo 88). These events were accompanied by a scale of public expenditure, construction, and development not previously seen in the state of Queensland. Brisbane's population growth has exceeded the national average every year since 1990 at an average rate around 2.2% per year. After two decades of record population growth, Brisbane was hit again by a major flood in January 2011. The Brisbane River did not reach the same height as the previous 1974 flood, but still caused extensive damage and disruption to the city. Brisbane also gained further international recognition, hosting the final Goodwill Games in 2001, and also some of the games in the 2003 Rugby World Cup, as well as the 2014 G20 Brisbane summit. In recent years the rate of people leaving Brisbane for elsewhere has increased, there has been a notable increase in people moving to places such as Townsville and interstate. Brisbane is in the southeast corner of Queensland. The city is centred along the Brisbane River, and its eastern suburbs line the shores of Moreton Bay. The greater Brisbane region is on the coastal plain east of the Great Dividing Range. Brisbane's metropolitan area sprawls along the Moreton Bay floodplain from Caboolture in the north to Beenleigh in the south, and across to Ipswich in the south west. The city of Brisbane is hilly. The urban area, including the central business district, are partially elevated by spurs of the Herbert Taylor Range, such as the summit of Mount Coot-tha, reaching up to 300 m (980 ft) and the smaller Enoggera Hill. Other prominent rises in Brisbane are Mount Gravatt and nearby Toohey Mountain. Mount Petrie at 170 m (560 ft) and the lower rises of Highgate Hill, Mount Ommaney, Stephens Mountain, and Whites Hill are dotted across the city. Also, on the west, are the higher Mount Glorious, (680 m), and Mount Nebo (550 m). The city is on a low-lying floodplain. Many suburban creeks criss-cross the city, increasing the risk of flooding. The city has suffered three major floods since colonisation, in February 1893, January 1974, and January 2011. The 1974 Brisbane Flood occurred partly as a result of Cyclone Wanda. Heavy rain had fallen continuously for three weeks before the Australia Day weekend flood (26–27 January 1974). The flood damaged many parts of the city, especially the suburbs of Oxley, Bulimba, Rocklea, Coorparoo, Toowong, and New Farm. The City Botanic Gardens were inundated, leading to a new colony of mangroves forming in the City Reach of the Brisbane River. The steel cantilever Story Bridge was constructed in 1940 to connect Fortitude Valley to Kangaroo Point. In the image on the right, the bridge is illuminated in blue for ovarian cancer awareness. The Brisbane central business district (CBD) lies in a curve of the Brisbane river. The CBD covers 2.2 km2 (0.8 sq mi) and is walkable. Central streets are named after members of the House of Hanover. Queen Street is Brisbane's traditional main street. Streets named after female members (Adelaide, Alice, Ann, Charlotte, Elizabeth, Margaret, and Mary) run parallel to Queen Street and Queen Street Mall (named in honour of Queen Victoria) and perpendicular to streets named after male members (Albert, Edward, George, William). The city has retained some heritage buildings dating back to the 1820s. The Old Windmill in Wickham Park, built by convict labour in 1824, is the oldest surviving building in Brisbane. The Old Windmill was originally used for the grinding of grain and a punishment for the convicts who manually operated the grinding mill. The Old Windmill tower's other significant claim to fame, largely ignored, is that the first television signals in the southern hemisphere were transmitted from it by experimenters in April 1934—long before TV commenced in most places. These experimental TV broadcasts continued until World War II. The Old Commissariat Store, on William Street, built by convict labour in 1828, was originally used partly as a grainhouse, has also been a hostel for immigrants and used for the storage of records. Built with Brisbane tuff from the nearby Kangaroo Point Cliffs and sandstone from a quarry near today's Albion Park Racecourse, it is now the home of the Royal Historical Society of Brisbane. It contains a museum and can also be hired for small functions. Greater Brisbane had a density of 148 people per square kilometre in 2016. Like most Australian and North American cities, Brisbane has a sprawling metropolitan area which takes in excess of one hour to traverse either north to south or east to west by car without traffic. Pre-1950 housing was often built in a distinctive architectural style known as a Queenslander, featuring timber construction with large verandahs and high ceilings. The relatively low cost of timber in south-east Queensland meant that until recently, most residences were constructed of timber, rather than brick or stone. Many of these houses are elevated on stumps (also called "stilts"), that were originally timber, but are now frequently replaced by steel or concrete. Queenslander houses are considered iconic to Brisbane and are typically sold at a significant premium to equivalent modern houses. Early legislation decreed a minimum size for residential blocks causing few terrace houses being constructed in Brisbane. The high-density housing that historically existed came in the form of miniature Queenslander-style houses which resemble the much larger traditional styles, but are sometimes only one-quarter the size. These houses are common in the inner-city suburbs. At the 2016 census, 76.4% of residents lived in separate houses, 12.6% lived in apartments, and 10% lived in townhouses, terrace houses, or semidetached houses. Brisbane is home to several of Australia's tallest buildings. Brisbane's tallest building is 1 William Street at 260 m, to be overtaken by the 270-m Brisbane Skytower, which is currently under construction. Brisbane has a humid subtropical climate (Köppen climate classification: Cfa) with hot, wet summers and dry, moderately warm winters. Brisbane experiences an annual mean minimum of 16.6 °C (62 °F) and mean maximum of 26.6 °C (80 °F), making it Australia's second-hottest capital city after Darwin. Seasonality is not pronounced, and average maximum temperatures of above 26 °C (79 °F) persist from October through to April. Due to its proximity to the Coral Sea and a warm ocean current, Brisbane's overall temperature variability is somewhat less than most Australian capitals. Summers are long, hot, and wet, but temperatures only occasionally reach 35 °C (95 °F) or more. Eighty percent of summer days record a maximum temperature of 27 to 33 °C (81 to 91 °F). Winters are short and warm, with average maximums of about 22 °C (72 °F); maximum temperatures below 20 °C (68 °F) are rare. Brisbane has never recorded a sub-zero minimum temperature (with one exception), and minimums are generally warm to mild year-round, averaging about 21 °C (70 °F) in summer and 11 °C (52 °F) in winter. From November to March, thunderstorms are common over Brisbane, with the more severe events accompanied by large damaging hail stones, torrential rain and destructive winds. On an annual basis, Brisbane averages 124 clear days. Dewpoints in the summer average at around 20 °C (68 °F); the apparent temperature exceeds 30 °C (86 °F) on almost all summer days. The city's highest recorded temperature was 43.2 °C (109.8 °F) on Australia Day 1940 at the Brisbane Regional Office, with the highest temperature at the current station being 41.7 °C (107.1 °F) on 22 February 2004; but temperatures above 38 °C (100 °F) are uncommon. On 19 July 2007, Brisbane's temperature fell below the freezing point for the first time since records began, registering −0.1 °C (31.8 °F) at the airport station. The city station has never dropped below 2 °C (36 °F), with the average coldest night during winter being around 6 °C (43 °F), however locations directly west of Brisbane such as Ipswich have dropped as low as −5 °C (23 °F) with heavy ground frost. In 2009, the current Brisbane weather station recorded its hottest winter day at 35.4 °C (95.7 °F) on 24 August; however, on the penultimate day of winter, the Brisbane Regional Office station recorded a temperature of 38.3 °C (100.9 °F) on 22 September 1943. The average July day however is around 22 °C (72 °F) with sunny skies and low humidity, occasionally as high as 27 °C (81 °F), whilst maximum temperatures below 18 °C (64 °F) are uncommon and usually associated with brief periods of cloud and winter rain. The highest minimum temperature ever recorded in Brisbane was 28.0 °C (82.4 °F) on 29 January 1940 and again on 21 January 2017, whilst the lowest maximum temperature was 10.2 °C (50.4 °F) on 12 August 1954. Brisbane's wettest day occurred on 21 January 1887, when 465 millimetres (18.3 in) of rain fell on the city, the highest maximum daily rainfall of Australia's capital cities. The wettest month on record was February 1893, when 1,025.9 millimetres (40.39 in) of rain fell, although in the last 30 years the record monthly rainfall has been a much lower 479.8 millimetres (18.89 in) from December 2010. Very occasionally a whole month will pass with no recorded rainfall, the last time this happened was August 1991. Brisbane is within the southern reaches of the tropical cyclone risk zone. Full strength tropical cyclones rarely effort Brisbane, but they do occasionally. The biggest risk is ex tropical cyclones which can cause destructive winds and flooding rains. The average annual temperature of the sea ranges from 21.0 °C (69.8 °F) in July to 27.0 °C (80.6 °F) in February. Unlike other Australian capital cities, a large portion of the greater metropolitan area, or Greater Capital City Statistical Area (GCCSA) of Brisbane is controlled by a single local government area, the City of Brisbane. Since the creation of the City of Brisbane in 1925 the urban areas of Brisbane have expanded considerably past the council boundaries. The City of Brisbane local government area is by far the largest local government area (in terms of population and budget) in Australia, serving more than 40% of the GCCSA's population. It was formed by the merger of twenty smaller LGAs in 1925, and covers an area of 1,367 km2 (528 sq mi). 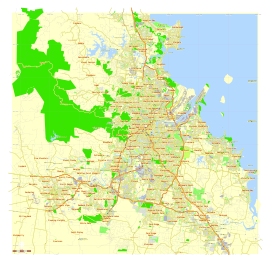 The remainder of the metropolitan area falls into the LGAs of Logan City to the south, Moreton Bay Region in the northern suburbs, the City of Ipswich to the south west, Redland City to the south east on the bayside, with a small strip to the far west in the Scenic Rim Region. White-collar industries include information technology, financial services, higher education and public sector administration generally concentrated in and around the central business district and recently established office areas in the inner suburbs. Blue-collar industries, including petroleum refining, stevedoring, paper milling, metalworking and QR railway workshops, tend to be located on the lower reaches of the Brisbane River and in new industrial zones on the urban fringe. Tourism is an important part of the Brisbane economy, both in its own right and as a gateway to other areas of Queensland. Since the late 1990s and early 2000s, the Queensland State Government has been developing technology and science industries in Queensland as a whole, and Brisbane in particular, as part of its "Smart State" initiative. The government has invested in several biotechnology and research facilities at several universities in Brisbane. The Institute for Molecular Bioscience at the University of Queensland (UQ) Saint Lucia Campus is a large CSIRO and Queensland state government initiative for research and innovation that is currently being emulated at the Queensland University of Technology (QUT) Campus at Kelvin Grove with the establishment of the Institute of Health and Biomedical Innovation (IHBI). Brisbane is one of the major business hubs in Australia. Most major Australian companies, as well as numerous international companies, have contact offices in Brisbane, while numerous electronics businesses have distribution hubs in and around the city. DHL Global's Oceanic distribution warehouse is located in Brisbane, as is Asia Pacific Aerospace's headquarters. Home grown major companies include Suncorp-Metway Limited, Flight Centre, Sunsuper, Orrcon, Credit Union Australia, Boeing Australia, Donut King, Wotif.com, WebCentral, PIPE Networks, Krome Studios, Mincom Limited, TechnologyOne, Thiess Pty Ltd and Virgin Australia. Brisbane has the fourth highest median household income of the Australian capital cities at AUD 57,772. The Port of Brisbane is on the lower reaches of the Brisbane River and on Fisherman's Island at the rivers mouth, and is the 3rd most important port in Australia for value of goods. Container freight, sugar, grain, coal and bulk liquids are the major exports. Most of the port facilities are less than three decades old and some are built on reclaimed mangroves and wetlands. The Port is a part of the Australia TradeCoast, the country's fastest-growing economic development area. Geographically, Australia TradeCoast occupies a large swathe of land around the airport and port. Commercially, the area has attracted a mix of companies from throughout the Asia Pacific region. Brisbane's Greater Capital City Statistical Area includes the Local Government Areas of City of Brisbane, City of Ipswich, Moreton Bay Region, Logan City and Redland City, as well as parts of Lockyer Valley Region, Scenic Rim Region and Somerset Region, which form a continuous metropolitan area. The Australian Bureau of Statistics estimates that the population of Greater Brisbane is 2,408,223 as of June 2017, making it the third largest city in Australia. The 2016 census showed that 32.2% of Brisbane's inhabitants were born overseas and 50.9% of inhabitants had at least one parent born overseas. Of inhabitants born outside of Australia, the four most prevalent countries of birth were New Zealand, England, Mainland China, and India. Brisbane has the largest New Zealand and Taiwanese-born populations of any city in Australia. At the 2016 census, 78% of inhabitants spoke only English at home, with the next most common languages being Mandarin (2.4%), Vietnamese (1.0%), Cantonese (0.9%), Spanish (0.7%), Hindi (0.6%), Samoan (0.6%), Korean (0.6%) and Punjabi (0.6%). At the 2016 census, the ancestries nominated by the largest proportion of inhabitants who stated their ancestries were English (39.7%), Australian (34.6%), Irish (13.2%), Scottish (11%), German (6.4%) and Chinese (4.7%). 2.4% of the population identify as indigenous Australians. By far the largest ethnic minority are Asian Australians. Within this group, the largest single ethnicity is Chinese Australians. The areas of Sunnybank, Sunnybank Hills, Stretton, Robertson, Calamvale, Macgregor, Eight Mile Plains, Runcorn and Rochedale, are home to a large proportion of Brisbane's Mainland China, Taiwan and Hong Kong-born population, with Chinese being the most commonly-reported ancestry in each of these areas. A significant portion of Brisbane's Vietnamese-born population reside in the areas of Inala, Darra and Durack. The most commonly nominated religious affiliations were 'No religion' (30.6%), Catholic (21.5%), Anglican (13.3%), Uniting Church (4.6%), 'Christian' (3.1%), Presbyterian and Reformed (2.6%), Baptist (2.2%), Buddhist (2%), Pentecostal (1.5%), Muslim (1.5%) and Hindu (1.5%). Brisbane has multi-campus universities and colleges including the University of Queensland (UQ), Queensland University of Technology (QUT) and Griffith University, all among Australia's highest rated universities. Other universities which have campuses in Brisbane include the Australian Catholic University, Central Queensland University, James Cook University, University of Southern Queensland and the University of the Sunshine Coast. Brisbane is also home to the Aboriginal Centre for the Performing Arts. There are three major TAFE colleges in Brisbane; the Brisbane North Institute of TAFE, the Metropolitan South Institute of TAFE, and the Southbank Institute of TAFE. Brisbane is also home to numerous other independent tertiary providers, including the Australian College of Natural Medicine, the Queensland Theological College, the Brisbane College of Theology, QANTM (SAE Institute), Jazz Music Institute, Jschool: Journalism Education & Training, JMC Academy, and American College. Many of Brisbane's preschool, primary, and secondary schools are under the jurisdiction of Education Queensland, a branch of the Queensland Government. There are also a large number of independent (private), Roman Catholic, Lutheran, and other Christian-run schools. Brisbane has an extensive transportation network within the city, as well as connections to regional centres, interstate and to overseas destinations. The use of urban public transport is still only a small component of total passenger transport, the largest component being travel by private car. Public transport is provided by bus, rail and ferry services. Bus services are operated by public and private operators whereas trains and ferries are operated by public agencies. The Brisbane central business district (CBD) is the central hub for all public transport services with services focusing on Queen Street bus station, Roma Street and Central railway stations, and various city ferries wharves. Brisbane's CityCat high speed ferry service, popular with tourists and commuters, operates services along the Brisbane River between the University of Queensland and Northshore Hamilton. The Queensland Rail City network consists of 10 suburban lines and covers mostly the west, north and east sides of the city. It also provides the route for an Airtrain service under joint public/private control between the City and Brisbane Airport. Since 2000, Brisbane has been developing a busway network, including the South East Busway, Northern Busway and the Eastern Busway. TransLink operates an integrated ticketing system across the public transport network. The Brisbane River has created a barrier to some road transport routes. In total there are ten road bridges, mostly concentrated in the inner city area. This has intensified the need for transport routes to focus on the inner city. There are also three railway bridges and two pedestrian bridges. The Eleanor Schonell Bridge (originally named, and still generally known as, The Green Bridge) between the University of Queensland and Dutton Park is for use by buses, pedestrians and cyclists. There are currently multiple tunnel and bridge projects underway as part of the TransApex plan. The Cross River Rail project includes a twin rail tunnel (5.9 kilometres (3.7 mi) long) which will pass under the Brisbane River to link two new railway stations at Albert Street in the Brisbane CBD and Wooloongabba; the project commenced in September 2017 with completion planned for 2024. An extensive network of pedestrian and cyclist pathways have been created along the banks of the Brisbane River to form a Riverwalk network. Brisbane is served by several urban and inter-urban motorways. The Pacific Motorway connects the central city with the Gold Coast to the south. The Ipswich Motorway connects the city with Ipswich to the west via the southern suburbs, while the Western Freeway and the Centenary Motorway provide a connection between Brisbane's inner-west and the outer south-west, connecting with the Ipswich Motorway south of the Brisbane River. The Bruce Highway is Brisbane's main route north of the city to the rest of the State. The Bruce Highway terminates 1,700 km (1,056 mi) away in Cairns and passes through most major cities along the Queensland coast. The Gateway Motorway is a private toll road which connects the Gold Coast and Sunshine Coasts by providing an alternate route via the Gateway Bridge avoiding Brisbane's inner city area. The Port of Brisbane Motorway links the Gateway to the Port of Brisbane, while Inner City Bypass and the Riverside Expressway act as the inner ring freeway system to prevent motorists from travelling through the city's congested centre. Brisbane's population growth placed strains on South East Queensland's transport system. The State Government and Brisbane City Council have responded with infrastructure plans and increased funding for transportation projects, such as the South East Queensland Infrastructure Plan and Program. Most of the focus has been placed on expanding current road infrastructure, particularly tunnels and bypasses, as well as improving the public transport system. Brisbane Airport (IATA code: BNE) is the city's main airport, the third busiest in Australia after Sydney Airport and Melbourne Airport. It is located north-east of the city centre and provides domestic and international passenger services. In the 2017, Brisbane Airport handled 23 million passengers. The airport is served by the Brisbane Airtrain, which provides a rail service from Brisbane's city centre to and from the airport. Archerfield Airport (in Brisbane's southern suburbs) acts as a general aviation airport. Within South East Queensland agglomeration, approximately 90 km (56 mi) south of city center located is Gold Coast Airport (6.5 million passengers in 2017), and 90 km (56 mi) north of the city center located is Sunshine Coast (1.1 million passengers). Water storage, treatment and delivery for Brisbane is handled by SEQ Water, which sells on to Queensland Urban Utilities (previously Brisbane Water) for distribution to the greater Brisbane area. Water for the area is stored in one of three dams; Wivenhoe, Somerset and North Pine. Since 13 May 2005, Brisbane has enforced water restrictions due to drought. This has also led to the State Government announcing that purified recycled water would be pumped into the dams once the pipeline was complete in 2009. More recently, restrictions were lifted and water conservation is no longer a major concern of council, although residents are asked to follow permanent conservation measures. Electricity and gas grids in Brisbane are handled by Energex (electricity), and Origin Energy (gas), with each company previously holding a monopoly on domestic retail supply. Since 1 July 2007 Queensland regulation changes have opened up the retail energy market, allowing multiple companies to resell both gas and electricity. Metropolitan Brisbane is serviced by all major and most minor telecommunications companies and their networks. Brisbane has the largest number of enabled DSL telephone exchanges in Queensland. An increasing number are also enabled with special hardware (DSLAMs) which enable high speed ADSL2+ internet access. The Brisbane CBD also features a complete underground fibre optics network, with numerous connections to the inner suburbs provided by various service providers. Telstra and Optus provide both high speed internet as well as Pay TV through their cable services for the bulk of the city's metropolitan area. Both of these providers also host wireless networks with hotspots within both the inner and suburban areas. In addition, Telstra, Optus and Vodafone all operate both 2.5G, 3G and 3.5G mobile phone networks citywide. Brisbane is covered by Queensland Health's "Metro North" and "Metro South" health services. Within the greater Brisbane area there are 8 major public hospitals, 4 major private hospitals, and smaller public and private facilities. Specialist and general medical practices are located in the CBD, and most suburbs and localities. In October 2015 Lord Mayor Graham Quirk announced plans to offer incentives for developers to build aged care and retirement facilities in some of the city's inner-suburban neighbourhoods. The scheme was based on the discounts for student accommodation infrastructure charges Quirk claimed had energised the student accommodation sector. In late August 2016 Quirk announced incentives reducing development infrastructure charges by 33 per cent for a three-year period and allowance for additional two storeys in medium and high density locations "where best practice design standards are met". The reason given was to enable people in inner suburban neighbourhoods to retire and go into aged care in the areas where they lived, and to increase aged care rooms and retirement units overall to meet growing demand. The Brisbane City Council's announcement said the 70 plus population of Brisbane was projected to increase by 50 per cent to 2027. The changes require revisions to the City Plan to include a new code for assessing aged care and retirement living development applications. Brisbane City Council's Labor opposition said the changes would benefit developers rather than consumers, claiming the discounts don't necessarily tend to translate into more affordable property and called for some of the reductions be used to help reduce property purchase prices. The Property Council of Australia said the policy would position Brisbane as a national leader in aged-care provision and avert a "seniors' housing shortfall". Major commercial property firm Savills Brisbane said the critical suburbs to benefit were in Brisbane's "inner middle ring" including Ashgrove, Wilston, Wooloowin, Coorparoo, Yeronga and Auchenflower. Brisbane has a substantial live theatre and music scene – both popular and classical. The Queensland Gallery of Modern Art (GOMA), opened in December 2006, is one of the latest additions to the South Bank precinct and houses some of the most well-known pieces of modern art from within and outside Australia. GOMA is the largest modern art gallery in Australia. GOMA holds the Asia Pacific Triennial (APT) which focuses on contemporary art from the Asia and Pacific in a variety of media from painting to video work. In Addition, its size enables the gallery to exhibit particularly large shows—the Andy Warhol exhibition being the largest survey of his work in Australia. GOMA also boasts Australia's largest purpose-built Cinémathèque. The Gallery of Modern Art is located next to the State Library of Queensland and the Queensland Art Gallery. The Queensland Performing Arts Centre (QPAC), which is located at South Bank, consists of the Lyric Theatre, a Concert Hall, Cremorne Theatre and the Playhouse Theatre and is home to the Queensland Ballet, Opera Queensland, Queensland Theatre Company, and the Queensland Symphony Orchestra. The Queensland Conservatorium, in which professional companies and Conservatorium students also stage performances, is located within the South Bank Parklands. Numerous choirs present performances across the city annually. These choirs include the Brisbane Chorale, Queensland Choir, Brisbane Chamber Choir, Canticum Chamber Choir, Brisbane Concert Choir, Imogen Children's Chorale and Brisbane Birralee Voices. Due to the lack of a suitable purpose built performance venue for choral music, these choirs typically perform in the city's many churches. In addition to dramatic and musical theatre performances at QPAC, the Brisbane Powerhouse in New Farm and the Judith Wright Centre of Contemporary Arts on Brunswick Street in Fortitude Valley feature diverse programs featuring exhibitions and festivals of visual art, music and dance. Brisbane is also home to numerous small theatres that provide access to emerging amateur and pro-am artists and companies. The oldest is the Brisbane Arts Theatre which was founded in 1936. It has a regular adult and children's theatre and is located in Petrie Terrace. The La Boite Theatre Company now performs at the Roundhouse Theatre at Kelvin Grove. Other professional theatres in the city include the Twelfth Night Theatre at Bowen Hills, the Metro Arts Theatre located in Edward Street, and the Queensland Theatre Company's Bille Brown Studio in West End. Brisbane has a substantial live popular music scene. Brisbane has maintained a constantly evolving live music scene, producing acts spanning genres including punk (see Brisbane punk rock), indie rock, electronic music, experimental music, noise rock, metal and post-punk. Brisbane's live music history is often intertwined with social unrest and authoritarian politics, as retold by journalist Andrew Stafford in Pig City: From The Saints to Savage Garden, Radical Brisbane: An Unruly History, edited by academics Raymond Evans and Carole Ferrier, and BNE – The Definitive Archive: Brisbane Independent Electronic Music Production 1979–2014, produced by record label director Dennis Remmer. Along with Beijing, Berlin, Birmingham and Marseille, Brisbane was nominated as one of the Top 5 International Music Hotspots by Billboard in 2007. There are also popular entertainment pubs and clubs within both the City and Fortitude Valley. The Bee Gees were born on the Isle of Man, lived in the United Kingdom during their early childhoods, but raised in Redcliffe and Cribb Island, Brisbane. The members of Powderfinger met at Brisbane Grammar School and the University of Queensland, and found early popularity within Brisbane. Indie band The Go-Betweens (after whom Brisbane's Go Between Bridge is named) were based out of Brisbane, and many of their songs and albums, such as Spring Hill Fair, reflect the attitude of 1980s Brisbane. The Veronicas' Lisa and Jessica Origliasso were born and raised in Albany Creek, Brisbane. The Saints, based in Brisbane since 1974, were one of the first punk rock bands. Sheppard reached No. 1 on the ARIA Singles Chart after forming in Brisbane in 2009. Savage Garden formed in the 1990s after Darren Hayes responded to Daniel Jones' advertisement in a Brisbane newspaper. Pete Murray was raised in Brisbane. Ball Park Music is a five-piece indie rock/pop band based in Brisbane, Australia, made up of frontman Sam Cromack, Jennifer Boyce, Paul Furness, and twins Dean Hanson and Daniel Hanson. Grace Shaw, who performs as Mallrat, is an Australian musician, singer, and rapper from Brisbane. Harriette Pilbeam, known professionally as Hatchie, is a Brisbane singer-songwriter and musician. She attended Brisbane Girls Grammar School from 2006–2010. Twoset Violin, a duo of violinists Brett Yang and Eddy Chen – both from Brisbane. They perform on YouTube and live, combining virtuosic violin playing and comedy. Brisbane is featured in music including The Saints' "Brisbane (Security City)" (1978); The Stranglers' "Nuclear Device" (1979) about Joh Bjelke-Petersen; "Love You Brisbane" theme single from the 1980s; Midnight Oil's single "Dreamworld" (1987); Powderfinger's album Vulture Street (2003). Brisbane has hosted several major sporting events including the 1982 Commonwealth Games and the 2001 Goodwill Games. The city also hosted events during the 1987 Rugby World Cup, 1992 Cricket World Cup, 2000 Sydney Olympics, the 2003 Rugby World Cup and hosted the Final of the 2008 Rugby League World Cup and will host along with the Gold Coast, some events for the 2018 Commonwealth Games. In 2005, then Premier Peter Beattie announced plans for Brisbane to bid to host the 2024 Olympic Games, which in August 2008 received in principle Australian Olympic Committee support, including that of the former Queensland Premier Anna Bligh and former Brisbane Lord Mayor Campbell Newman. 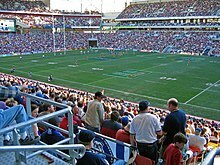 The most popular professional club in the city is the Brisbane Broncos, who play in the National Rugby League competition. Rugby Union is also very popular in Brisbane and the city hosts the Queensland Reds who play Super Rugby. Brisbane also hosts a professional soccer team named Brisbane Roar FC and an AFL club the Brisbane Lions. In 2016, Brisbane re-introduced their Basketball team the Brisbane Bullets into the National Basketball League (Australia) after a 7-year hiatus. The city's major sporting venues include the Gabba, Sleeman Centre at Chandler, Suncorp Stadium (Lang Park), Ballymore Stadium and the stadium facilities of the Queensland Sport and Athletics Centre in Nathan. With the closure of the Milton Tennis grounds in 1994, Brisbane lacked a major tennis facility. 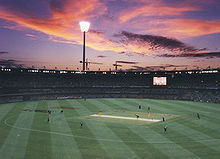 In 2005, the State Government approved the State Tennis Centre a new A$65 million tennis stadium. The construction was completed in 2008. The Brisbane International is held here from January 2009. Major cultural events in Brisbane include the Ekka (the Royal Queensland Exhibition), held each August, and the Riverfestival, held each September at South Bank Parklands and surrounding areas. Warana (meaning Blue Skies) was a former spring festival which began in 1961 and was held in September each year. Run as a celebration of Brisbane, Warana was similar to Melbourne's Moomba festival. In 1996 the annual festival was changed to a biennial Brisbane Festival. The Brisbane International Film Festival (BIFF) is held in July/August in a variety of venues around Brisbane. BIFF features new films and retrospectives by domestic and international filmmakers along with seminars and awards. The Paniyiri festival at Musgrave Park (corner of Russell and Edmondstone Streets, South Brisbane) is an annual Greek cultural festival held over two days in May. The Brisbane Medieval Fayre and Tournament is held each June in Musgrave Park. The Valley Fiesta is an annual three-day event organised by the Valley Chamber of Commerce. It was launched by Brisbane Marketing in 2002 to promote Fortitude Valley as a hub for arts and youth culture. It features free live music, market stalls, food and drink from many local restaurants and cafés, and other entertainment. The Bridge to Brisbane fun run has become a major annual charity event for Brisbane. The Caxton Street Seafood and Wine Festival was launched in 1994 by the Caxton Street Development Association to promote Caxton Street in historic Petrie Terrace as a significant entertainment precinct that celebrates and promotes Australian music, seafood and wine. It features live music, food and drink from Caxton Street restaurants and cafés, as well as Art Exhibitions and Historical Displays and a dedicated annual Festival Band Competition. The annual Buddha Birth Day festival at Brisbane's South Bank is thought to be the world's largest, attracting over 200,000 visitors each year. Tourism plays a major role in Brisbane's economy, being the third-most popular destination for international tourists after Sydney and Melbourne. Popular tourist and recreation areas in Brisbane include the South Bank Parklands, Roma Street Parkland, the City Botanic Gardens, Brisbane Forest Park and Portside Wharf. The Lone Pine Koala Sanctuary opened in 1927 and was the world's first koala sanctuary. The suburb of Mount Coot-tha is home to a popular state forest, and the Brisbane Botanic Gardens which houses the Sir Thomas Brisbane Planetarium and the "Tsuki-yama-chisen" Japanese Garden (formerly of the Japanese Government Pavilion of Brisbane's World Expo '88). Brisbane has over 27 km (17 mi) of bicycle pathways, mostly surrounding the Brisbane River and city centre, extending to the west of the city. The river itself was popular with bathers, and it permitted boating excursions to Moreton Bay when the main port was in the city reaches. Today fishing and boating are more common. Other popular recreation activities include the Story Bridge adventure climb and rock climbing at the Kangaroo Point Cliffs. The nearby Australia Zoo, made famous by Steve Irwin, also encourages many tourists to visit Brisbane. In 2015, a competition by travel guidebook Rough Guides saw Brisbane elected as one of the top ten most beautiful cities in the world, citing reasons such as "its winning combination of high-rise modern architecture, lush green spaces and the enormous Brisbane River that snakes its way through the centre before emptying itself into the azure Moreton Bay." The main newspapers of Brisbane are The Courier-Mail and The Sunday Mail, both owned by News Corporation. Brisbane receives the national daily, The Australian, and the Weekend Australian (also both News Corp), together with Fairfax papers The Australian Financial Review, The Sydney Morning Herald and The Age, and Fairfax website Brisbane Times. There are community and suburban newspapers throughout the metropolitan area, including Brisbane News and City News, many of which are produced by Quest Community Newspapers. The former free afternoon paper mX was distributed in Brisbane from 2007 until its closing in 2015. Brisbane is served by all five major television networks in Australia, which broadcast from the summit of Mount Coot-tha. The three commercial stations, Seven, Nine, and Ten, are accompanied by two government networks, ABC and SBS, with all five providing digital television. Channels available in addition to ABC, Seven, Nine, Network 10 and SBS include 10 Bold, 10 Peach, TVSN, Spree TV, ABC HD (ABC broadcast in HD), ABC COMEDY/KIDS, ABC ME, ABC News, SBS HD (SBS broadcast in HD), SBS Viceland, SBS Viceland HD (SBS Viceland broadcast in HD), Food Network, NITV, 7HD (Seven broadcast in HD), 7Two, 7mate, 7flix, TV4ME, RACING.COM, 9HD (Nine broadcast in HD), 9Gem, 9Go!, 9Life and eXtra. 31, a community station, also broadcasts in Brisbane. Optus and Foxtel operate PayTV services in Brisbane, via cable and satellite means. Brisbane is serviced by major commercial radio stations, including 4KQ, 4BC, 4BH, 97.3 FM, HIT 105 FM, Nova 106.9, RadioTAB and Triple M. Brisbane is also serviced by major community radio stations such as 96five Family FM, 4MBS Classic FM 103.7, 4EB FM and 4ZZZ 102.1. It is also serviced by narrowcast radio stations such as Chinese National Radio and Vision Christian Radio. Additional channels are also available via DAB digital radio. The ABC transmits all five of its radio networks to Brisbane; 612 ABC Brisbane, ABC Classic FM, ABC NewsRadio, Radio National, and Triple J. SBS broadcasts its national radio network. "Brisvegas" is an ironic nickname given to the city. This has been attributed to an Elvis Presley tribute CD and the city's growing live music scene. It is believed to have been first used in print in a 1996 edition of The Courier-Mail, also about the time of the opening of the Treasury Casino in Brisbane and the popularisation of poker machines in Brisbane bars and clubs, a play on the popular gaming ground of Las Vegas. The name has also been attributed to the city's nightlife, compact size of the central business district and perceived lack of sophistication, a comparison to the ostensibly kitsch and crass Las Vegas. ^ "Great Circle Distance between BRISBANE and SYDNEY". Geoscience Australia. March 2004. Archived from the original on 7 February 2016. Retrieved 17 January 2016. ^ "Great Circle Distance between BRISBANE and CANBERRA". Geoscience Australia. March 2004. Archived from the original on 7 February 2016. Retrieved 17 January 2016. ^ "Great Circle Distance between BRISBANE and MELBOURNE". Geoscience Australia. March 2004. Archived from the original on 7 February 2016. Retrieved 17 January 2016. ^ "Great Circle Distance between BRISBANE and ADELAIDE". Geoscience Australia. March 2004. Archived from the original on 7 February 2016. Retrieved 17 January 2016. ^ "Great Circle Distance between BRISBANE and PERTH". Geoscience Australia. March 2004. Archived from the original on 7 February 2016. Retrieved 17 January 2016. ^ Macquarie Dictionary. The Macquarie Library. 2003. p. 121. ISBN 1-876429-37-2. ^ a b "Brisbane (entry 4555)". Queensland Place Names. Queensland Government. Retrieved 14 March 2014. ^ "3218.0 – Regional Population Growth, Australia, 2015–16". Australian Bureau of Statistics. Archived from the original on 30 March 2017. ERP at 30 June 2016. ^ "Brisbane and Greater Brisbane". Queensland Places. Archived from the original on 27 January 2014. ^ Kent, Lucinda (21 March 2014). "Is this the average Brisbanite?". ABC Radio Brisbane. Australian Broadcasting Corporation. Archived from the original on 31 August 2014. Retrieved 20 April 2019. ^ "Names for where we're from". ABC Radio National. Australian Broadcasting Corporation. 13 October 2012. Retrieved 20 April 2019. ^ "South West Pacific campaign". www.ww2places.qld.gov.au. Queensland Government. Archived from the original on 5 February 2016. Retrieved 22 January 2016. ^ "The World According to GaWC 2016". www.lboro.ac.uk. Archived from the original on 3 May 2017. Retrieved 24 May 2017. ^ Archibald Meston. "Aboriginal Indigeneous Tribes of Brisbane and Moreton Bay". Archived from the original on 12 July 2017. Retrieved 17 July 2017. ^ Tony Moore (17 May 2012). "The indigenous history of Musgrave Park". Brisbane Times. Archived from the original on 30 July 2017. Retrieved 17 July 2017. ^ "Tom Petrie's Early Reminiscences of Early Queensland". Archived from the original on 1 September 2013. Retrieved 24 November 2008. ^ Ros Kidd. "Aboriginal History of the Princess Alexandra Hospital Site". Diamantina Health Care Museum Association Inc. Archived from the original on 2 August 2017. Retrieved 17 July 2017. ^ "Redcliffe". The Sydney Morning Herald. 8 February 2004. Archived from the original on 23 May 2008. Retrieved 17 May 2008. ^ a b "John Oxley Governor Report". Archived from the original on 1 September 2013. Retrieved 1 February 2010. ^ Potter, Ron. "Place Names of South East Queensland". Piula Publications. Archived from the original on 23 May 2008. Retrieved 17 May 2008. ^ Irving, Robert (1998). Reader's Digest Book of Historic Australian Towns. p. 70. ISBN 0-86449-271-5. ^ "Sir Thomas 28 miles up the Brisbane River". MOST Brisbane. Archived from the original on 1 July 2016. Retrieved 24 June 2016. ^ compiled by Royal Automobile Club of Queensland. (1980). Seeing South-East Queensland (2 ed.). RACQ. p. 7. ISBN 0-909518-07-6. ^ "About Redcliffe". Redcliffe City Council. Archived from the original on 17 November 2007. Retrieved 1 December 2007. ^ Lybaek, Lena; Konrad Raiser; Stefanie Schardien (2004). Gemeinschaft der Kirchen und gesellschaftliche Verantwortung. Münster: LIT. p. 114. ISBN 978-3-8258-7061-4. ^ "Christopher Eipper (1813–1894)". Street Signs — And What They Mean. Pelican Waters Shire Council. Archived from the original on 18 November 2007. Retrieved 20 December 2007. ^ "Frank Henry Vogler | German Immigrant | Johann Cesar 1863". mcnamarafamily.id.au. Archived from the original on 27 February 2016. Retrieved 10 March 2016. ^ "German Settlement in Queensland in the 19th Century". www.germanaustralia.com. Archived from the original on 15 December 2016. Retrieved 10 March 2016. ^ a b "Patrick Logan" (PDF). Archived (PDF) from the original on 5 February 2016. ^ de Strzelecki, Paul Edmond (1845). Physical Description of New South Wales and Van Diemen's Land: Accompanied by a Geological Map, Sections, and Diagrams. London, United Kingdom: Longman, Brown, Green, and Longmans. ^ "The Queensland Proclamation" (PDF). Queensland Government Archives. Archived (PDF) from the original on 29 June 2014. Retrieved 2 October 2014. ^ "Jolly, William Alfred (1881–1955)". Australian Dictionary of Biography. Archived from the original on 26 May 2008. Retrieved 20 December 2007. ^ "Brisbane". ANZAC Day Commemoration Committee (Qld) Incorporated. 1998. Archived from the original on 12 October 2007. Retrieved 28 December 2007. ^ Peter Dunn (2 March 2005). "Hirings Section". Australia @ War. Archived from the original on 12 October 2007. Retrieved 7 January 2008. ^ "QM Supply in the Pacific during WWII". Quartermaster Professional Bulletin. Spring 1999. Archived from the original on 21 February 2004. Retrieved 7 January 2008. ^ Peter Dunn (27 August 2005). "The Battle of Brisbane — 26 & 27 November 1942". Australia @ War. Archived from the original on 10 January 2008. Retrieved 7 January 2008. ^ Swanwick, Tristan (12 December 2010). "Filmmakers on trail of Brisbane Bard". The Courier-Mail. Archived from the original on 8 February 2012. Retrieved 10 February 2012. ^ "ACGA Past Games 1982". Commonwealth Games Australia. Archived from the original on 17 September 2007. Retrieved 28 December 2007. ^ Rebecca Bell. "Expo 88 / Brisbane". OZ Culture. Archived from the original on 28 January 1999. Retrieved 28 December 2007. ^ Berry, Petrina (13 January 2011). "Brisbane braces for flood peak as Queensland's flood crisis continues". The Courier-Mail. Archived from the original on 16 August 2011. Retrieved 14 January 2011. ^ "Before and after photos of the floods in Brisbane". Abc.net.au. Archived from the original on 12 July 2011. Retrieved 4 November 2012. ^ Gregory, Helen (2007). Brisbane Then and Now. Wingfield, South Australia: Salamander Books. p. 60. ISBN 978-1-74173-011-1. ^ "Flood-proof road destroyed in deluge". ABC News. Archived from the original on 6 July 2014. ^ Gunn, Angus M. (1978). Habitat: Human Settlements in an Urban Age. Pergamon Press. p. 178. ISBN 0-08-021487-8. ^ "Timeline for Brisbane River" (PDF). Coastal CRC. Archived from the original (PDF) on 16 February 2008. Retrieved 4 January 2008. ^ "TimeWalks Brisbane — Windmill". Queensland Government. 24 March 2008. Archived from the original on 19 December 2007. Retrieved 10 April 2008. ^ Statham-Drew, Pamela (1990). The Origin of Australia's Capital Cities. Cambridge University Press. p. 257. ISBN 978-0-521-40832-5. ^ Pike, Jeffrey (2002). Australia. Insight. ISBN 978-981-234-799-2. ^ "The Commissariat Stores". Archived from the original on 23 May 2008. Retrieved 24 February 2008. ^ a b c d e f g "2016 Census QuickStats". Australian Bureau of Statistics. Archived from the original on 14 July 2017. Retrieved 4 August 2017. ^ CTBUH. > "CTBUH Tall Building Database – The Skyscraper Center". Skyscrapercenter. ^ "Climate: Brisbane – Climate graph, Temperature graph, Climate table". Climate-Data.org. Archived from the original on 15 December 2013. Retrieved 28 August 2013. ^ Tapper, Andrew; Tapper, Nigel (2006). "Sub-Synoptic-Scale Processes and Phenomena". In Gray, Kathleen (ed.). The weather and climate of Australia and New Zealand (Second ed.). Melbourne, Australia: Oxford University Press. p. 346. ISBN 978-0-19-558466-0. ^ Linacre, Edward; Geerts, Bart (1997). "Southern Climates". Climates and Weather Explained. London: Routledge. p. 379. ISBN 0-415-12519-7. ^ a b "Climate statistics for Australian stations – Brisbane". Bureau of Meteorology. Archived from the original on 13 August 2017. Retrieved 12 February 2018. ^ "Brisbane Aero". Climate statistics for Australian locations. Bureau of Meteorology. Retrieved 20 November 2014. ^ a b c d "Brisbane". Climate statistics for Australian locations. Bureau of Meteorology. Retrieved 16 June 2013. ^ a b c "Brisbane Regional Office". Climate statistics for Australian locations. Bureau of Meteorology. Retrieved 15 January 2017. ^ Daniel Sankey and Tony Moore (19 July 2007). "Coldest day on record for Brisbane". The Brisbane Times. Archived from the original on 12 October 2007. Retrieved 5 January 2008. ^ "AMBERLEY AMO". Climate statistics for Australian locations. Bureau of Meteorology. February 2014. Retrieved 9 February 2014. ^ Unknown (24 August 2009). "Hot August day as Records Fall". The Brisbane Times. Archived from the original on 27 August 2009. Retrieved 31 August 2010. ^ "Brisbane Climate Guide". Archived from the original on 5 October 2011. Retrieved 9 October 2011. ^ "Brisbane City Council". NetCat. Archived from the original on 29 August 2007. Retrieved 28 December 2007. ^ Department of Tourism, Regional Development and Industry (14 December 2007). "Brisbane's business visitors drive $412 million domestic tourism increase". Brisbane Marketing. Archived from the original on 9 May 2008. Retrieved 29 December 2007. ^ "Greater Brisbane; Unemployment rate; Persons; series A84600151F". 6291.0.55.001 Labour Force, Australia, Detailed – Electronic Delivery. Australian Bureau of Statistics. Archived from the original on 19 June 2016. ^ "What is the Smart State". Queensland Government. Archived from the original on 29 December 2007. Retrieved 29 December 2007. ^ Peter Beattie (4 December 2007). "Brain power drives Smart State". The Courier-Mail. Archived from the original on 2 July 2012. Retrieved 29 December 2007. ^ "Brisbane business visitor numbers skyrocket". Brisbane Marketing Convention Bureau. e-Travel Blackboard. 3 January 2008. Archived from the original on 20 January 2011. Retrieved 13 January 2008. ^ "2006 Census QuickStats by Location". Australian Bureau of Statistics. Archived from the original on 27 July 2008. Retrieved 19 July 2008. ^ "Brisbane Container Terminal, Australia". Port Technology. Archived from the original on 23 January 2008. Retrieved 29 December 2007. ^ a b "About Us". Australia TradeCoast. Archived from the original on 8 January 2008. Retrieved 13 January 2008. ^ "2016 Census QuickStats: Sunnybank". Censusdata.abs.gov.au. Archived from the original on 14 July 2017. Retrieved 19 September 2017. ^ "2016 Census QuickStats: Sunnybank Hills". Censusdata.abs.gov.au. Archived from the original on 14 July 2017. Retrieved 19 September 2017. ^ "2016 Census QuickStats: Stretton". Censusdata.abs.gov.au. Archived from the original on 14 July 2017. Retrieved 19 September 2017. ^ "2016 Census QuickStats: Robertson (Qld)". Censusdata.abs.gov.au. Archived from the original on 14 July 2017. Retrieved 19 September 2017. ^ "2016 Census QuickStats: Calamvale". Censusdata.abs.gov.au. Archived from the original on 14 July 2017. Retrieved 19 September 2017. ^ "2016 Census QuickStats: Macgregor (Qld)". Censusdata.abs.gov.au. Archived from the original on 14 July 2017. Retrieved 19 September 2017. ^ "2016 Census QuickStats: Eight Mile Plains". Censusdata.abs.gov.au. Archived from the original on 14 July 2017. Retrieved 19 September 2017. ^ "2016 Census QuickStats: Runcorn". Censusdata.abs.gov.au. Archived from the original on 14 July 2017. Retrieved 19 September 2017. ^ "2016 Census QuickStats: Rochedale". Censusdata.abs.gov.au. Archived from the original on 14 July 2017. Retrieved 19 September 2017. ^ "2016 Census QuickStats: Inala". Censusdata.abs.gov.au. Archived from the original on 14 July 2017. Retrieved 19 September 2017. ^ "2016 Census QuickStats: Durack (Qld)". Censusdata.abs.gov.au. Archived from the original on 14 July 2017. Retrieved 19 September 2017. ^ "TAFE Queensland". Queensland Government. Archived from the original on 29 August 2007. Retrieved 2 December 2007. ^ "Education Queensland". Queensland Government. Archived from the original on 17 November 2007. Retrieved 2 December 2007. ^ "Year Book Australia, 2005". ABS. Archived from the original on 14 December 2007. Retrieved 19 February 2008. ^ "Cross River Rail to dominate Queensland election". The Courier Mail. News Corp. 17 June 2017. Retrieved 19 June 2017. ^ "About RiverWalk". Brisbane City Council. Archived from the original on 22 May 2008. Retrieved 5 January 2008. ^ "The upgrade". Gateway Upgrade Project. Archived from the original on 6 July 2011. Retrieved 5 January 2008. ^ Emma Chalmers, Jeremy Pierce and Neil Hickey (8 February 2008). "Queensland Water Commission retain restrictions". The Courier-Mail. Archived from the original on 11 February 2008. Retrieved 2 March 2008. ^ Peter Beattie. "SEQ Will Ave Purified Recycled Water But No Vote: Premier" (Ministerial media statement). Queensland Government. Archived from the original on 22 May 2008. Retrieved 29 February 2008. ^ "Full Retail Competition". Queensland Department of Mines and Energy. Archived from the original on 2 November 2007. Retrieved 2 March 2008. ^ Roland Tellzen (1 April 2008). "Mobile broadband takes off". The Australian. news.com.au. Archived from the original on 7 April 2008. Retrieved 17 April 2008. ^ "Hospital and Health Service maps". Queensland Health. Archived from the original on 9 November 2017. Retrieved 8 November 2017. ^ Cameron, Atfield (22 October 2015). "Graham Quirk plans aged care incentives for Brisbane". Brisbane Times. Fairfax Media. Archived from the original on 5 January 2017. Retrieved 1 September 2016. ^ Graham, Quirk. "Incentives for new retirement and aged care". Graham Quirk. Graham Quirk. Archived from the original on 13 September 2016. Retrieved 1 September 2016. ^ Atfield, Cameron (30 August 2016). "Aged care incentives will 'go straight to developers': Labor". Brisbane Times. Fairfax Media. Archived from the original on 4 January 2017. Retrieved 1 September 2016. ^ "BRISBANE MOVES TO AVERT SENIORS' HOUSING SHORTFALL". Property Council of Australia. Property Council of Australia. 30 August 2016. Archived from the original on 11 September 2016. Retrieved 2 September 2016. ^ Dunne, Robert (30 August 2016). "Aged Care incentives benefit inner-suburban Brisbane". Queensland Commercial Property (Savills Brisbane). Savills Brisbane. Archived from the original on 18 September 2016. Retrieved 2 September 2016. ^ Remmer, Dennis (2014). BNE – The Definitive Archive: Brisbane Independent Electronic Music Production 1979–2014. Transmission Communications. p. 41. ISBN 9780646921501. ^ "Billboard Loves Brisbane". Music News. Triple J. Archived from the original on 12 October 2007. Retrieved 15 November 2007. ^ "Beijing, Berlin among music hot spots in 2007". Music News. Reuters. 1 January 2007. Archived from the original on 21 May 2008. Retrieved 29 December 2007. ^ Eleanor Hall (1 April 2005). "Brisbane keen to bid for 2024 Olympics". The World Today. ABC. Archived from the original on 12 October 2007. Retrieved 5 January 2008. ^ "National Basketball League: Brisbane Bullets make comeback after seven-year absence". Archived from the original on 20 September 2015. Retrieved 6 December 2018. ^ "Origin of State Colours Queensland Maroons & NSW Blues". RL1908. Archived from the original on 29 September 2007. Retrieved 30 December 2007. ^ "Introduction". Queensland Bulls. Archived from the original on 9 February 2008. Retrieved 30 December 2007. ^ "All About the Brisbane Lions". Brisbane Lions. Archived from the original on 1 December 2007. Retrieved 30 December 2007. ^ "Wide World of Sports breaking news and live scores". Archived from the original on 27 September 2015. ^ "History of Netball Queensland". Netball Queensland. Archived from the original on 31 July 2009. Retrieved 30 December 2007. ^ "History". Brisbane Festival. Archived from the original on 20 February 2008. Retrieved 2 March 2008. ^ "2015 Buddha Birth Day Festival". Archived from the original on 17 October 2015. Retrieved 26 June 2015. ^ "Buddha Birth Day Festival". Visit Brisbane. Archived from the original on 12 March 2018. Retrieved 12 March 2018. ^ "International Market Tourism Facts" (PDF). Tourism Australia. Archived from the original (PDF) on 7 March 2008. ^ a b Gregory, Helen (2007). Brisbane Then and Now. Wingfield, South Australia: Salamander Books. p. 140. ISBN 978-1-74173-011-1. ^ "Brisbane voted one of most beautiful cities". Brisbane Times. Archived from the original on 18 February 2015. 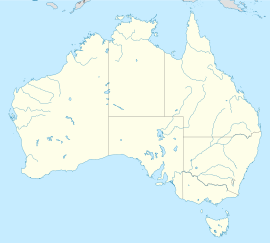 ^ "The Australian Radio Guide – AM (Mediumwave) Stations – Queensland". www.radioheritage.net. Archived from the original on 30 November 2018. Retrieved 30 November 2018. ^ a b "Brisbane Residents Embrace City Living". The Age. 2 November 2005. Archived from the original on 26 December 2011. Retrieved 4 April 2008. ^ a b Tilston, John. Meanjin to Brisvegas: Brisbane Comes of Age. pp. 147–148. ISBN 1-4116-5216-9. ^ "Billboard Backs Brisvegas". The Age. 25 January 2007. Archived from the original on 26 December 2011. Retrieved 4 April 2008. ^ "City Guide: Brisbane". BBC Sport. 25 September 2003. Archived from the original on 8 May 2009. Retrieved 4 April 2008. ^ Amanda Horswill (15 May 2007). "What's in a Name?". The Courier-Mail. Archived from the original on 24 June 2007. Retrieved 4 April 2008. What Did Brisbane Look Like in 1935?